The History Channel has a hit on their hands with the show “Pawn Stars” where collectors visit a Las Vegas pawn shop to have the staff make offers on their rare collectibles. 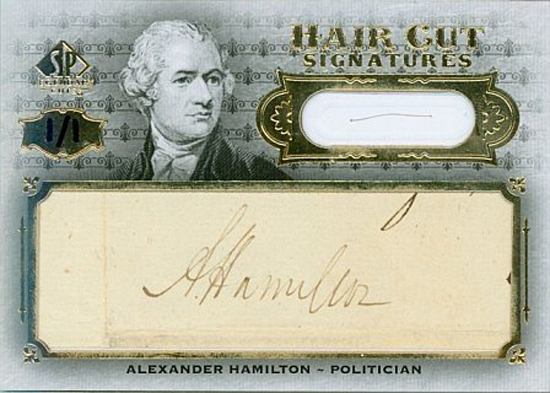 In the episode “Hair Force One” which aired for the first time last night, a collector comes in with one of the most-unique collectibles Upper Deck has ever released. 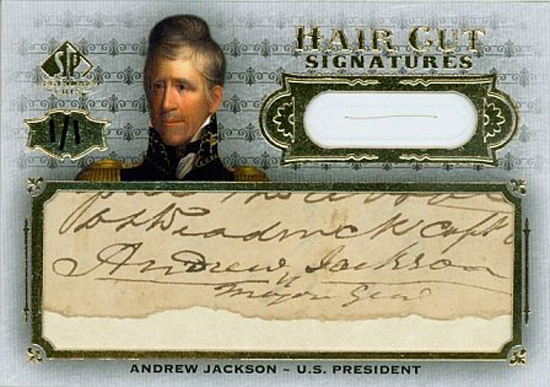 He was looking to sell his Upper Deck George Washington autograph hair card. 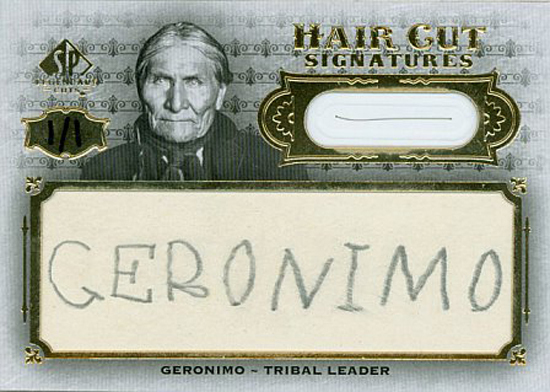 From the 2008 SP Legendary Cuts Baseball product, Upper Deck had ten total trading cards produced of notable names like George Washington, Abraham Lincoln, Geronimo, Andrew Jackson, Alexander Hamilton and Babe Ruth that featured a cut signature from the personality and an actual encapsulated strand of their hair. 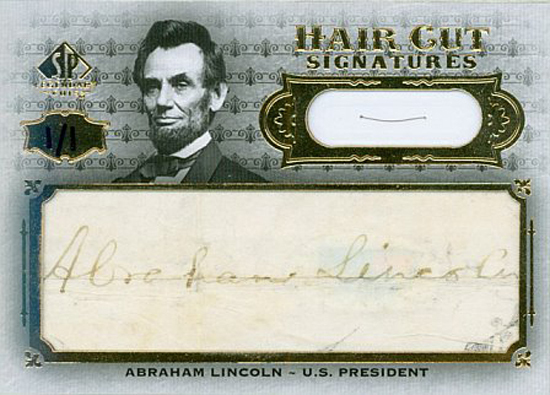 All ten of these cards have an authentic cut signature and hair strand. Each is numbered 1/1, making them a true, one-of-a-kind collectible. 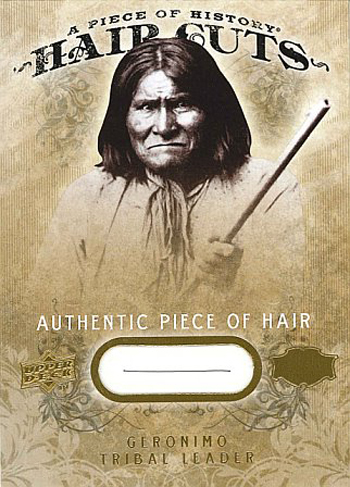 When the product was first released, there was a huge “buzz” about these cards in the market and still to this day there is tremendous interest in them because they are so different. 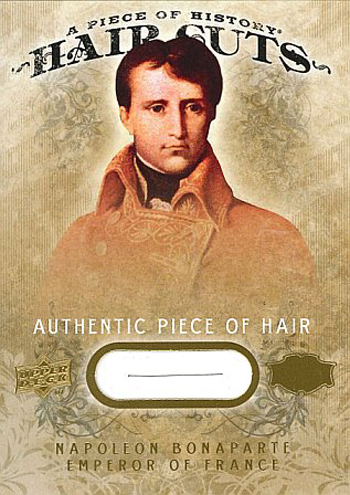 Shortly after that release, Upper Deck put out another series of “Hair Cuts” cards in 2008 A Piece of History Baseball with strands of hair from more personalities like Napolean Bonaparte, Lord Nelson, King George III and more! This dude spent 1100$ on a strand of George Washington‘s hair… WTF? 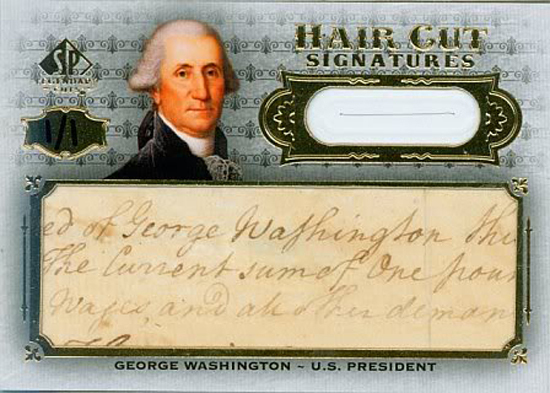 How you gonna ask $75000 for one piece of George Washington‘s hair? Upper Deck continues working to innovate trading cards with every new release. Just in the last year Upper Deck continued to press the envelope on trading card evolution by releasing cards like the Exquisite Dimensions card where the autograph appears to be floating in air, the Exquisite Choice cards that allow collectors to assemble their perfect multi-signed autograph card, the “It Came From Space” meteorite cards and even the Goodwin Champions Museum Collection cards that housed authentic artifacts from the Civil War. Upper Deck has also released video trading cards and continues to refine that technology. As a company, we look forward to continue bringing fans the type of trading cards that get them excited and talking. 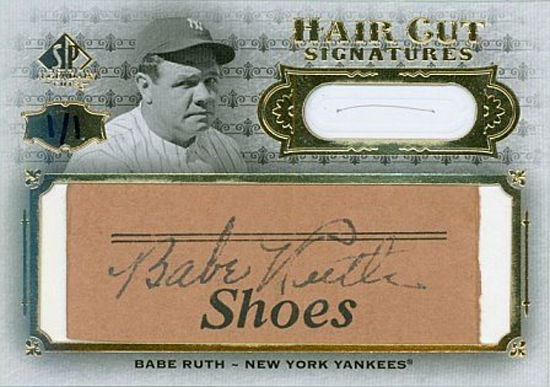 What do you think will be the next big thing Upper Deck brings to trading cards?